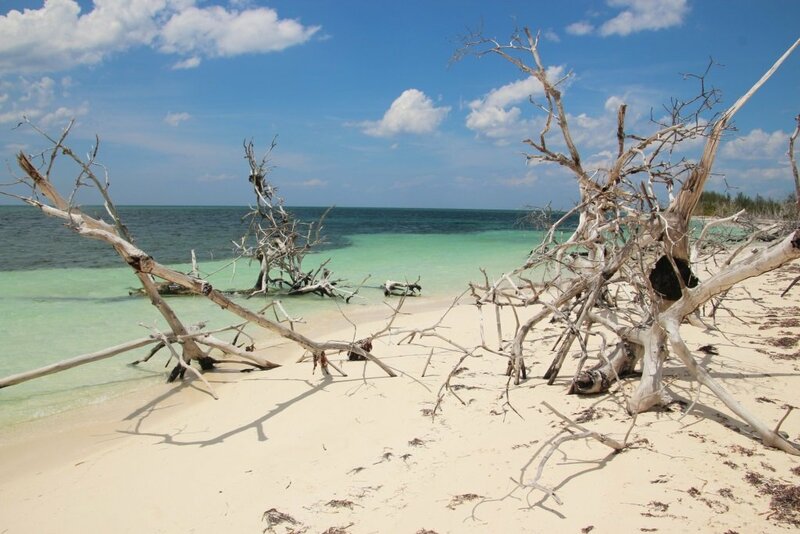 Cayo Levisa is a small island in the northern part of Cuba. Most people visit this island for a day tour from Viñales. There is one hotel on the island. The hotel has bungalows at the beach, which looked nice. We drove to the ferry. Here we had to buy a ticket for 35 CUC which is included a lunch buffet. This is a fixed price and you can’t buy only a ferry ticket. If you want to make it cheaper, you can book a tour from Viñales, which should cost 29 CUC, with transfer to the ferry, ferry ticket and a small sandwich. When you arrive with the ferry, you have to walk on a wooden walkway right in the middle of the mangrove forest. It is interesting to see the change. First the lush mangrove, then you can see a nice wooden building. Here the hotel area begins. The wooden walkway is taking you up to the beach. 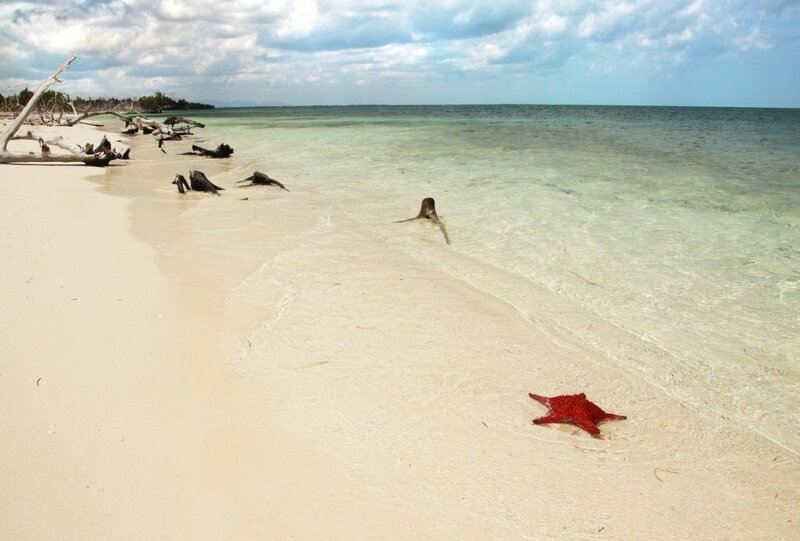 The beach of Cayo levisa is lovely! Soft white sand, explosive colors of the sea. The sand is so white you’ll need sunglasses for the reflection! As a welcome gift we got a nice natural juice of guava and watermelon. Because we traveled independently we just got to go on the beach and choose a nice sun chair. There was a big group which stuck together, so we just walked a little out to the side of the hotel area, but still with chairs. Here it was quiet and we could really relax. The sea was warm and good for a swim. There supposed to be some corals, but we tried to find it and we couldn’t. Only some sea grass, nothing else to see. 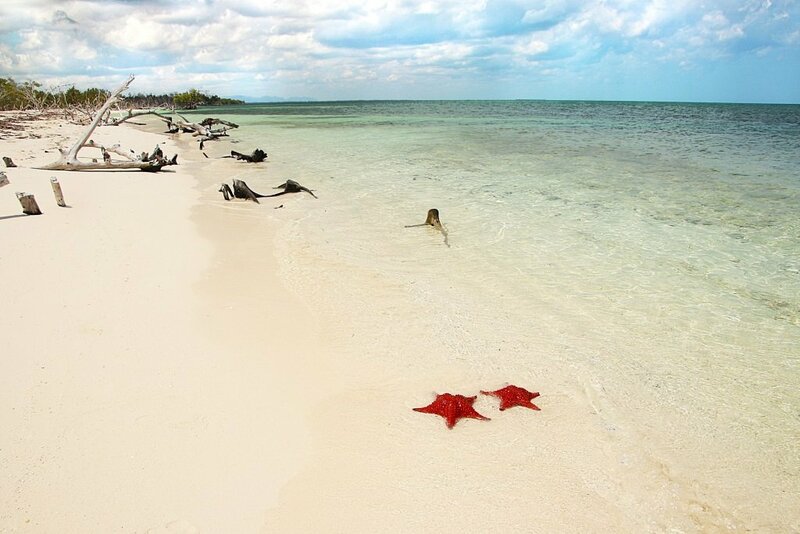 I heard from a fellow blogger 'Mirreopreis' that if you make a nice walk to the left, you might see some starfish. Of course I would love to check it out. Timo was making himself comfortable at a sun chair so it wouldn’t be a romantic beach walk as I had in my mind. I walked past the jetty point. The beach is not maintained as the beach upfront at the hotel. The sea grass is all over the beach. Still, with the white sand and beautiful colors of the sea it is a nice walk. The sand is easy to walk on. The beach is making a smooth bend to the left. Just follow the coastline. After about half an hour, you’ll see mangrove forest touching the sea. The island is really narrow here, both sides will touch the sea. At this point I saw about 15 bright red starfish! They are so big and colorful! In contrast, with the sea it gives really nice pictures. I really loved observing those starfish. I was one of the few people taking the nice walk. I asked a woman to take a picture of holding a star fish. They are harmless and you can pick them up. But please put them back in the sea after you have taken your picture! I walked quickly back. I wanted Timo to come with me and take a look at the starfish. Timo was reading his book and had no attention to take the walk. We decided to go for lunch. The lunch was in one of the 2 restaurants on the island. The buffet was really simple. Some salad and a fried fish. Some soup as entree. After the lunch, we swam a little. But I was eager to see the starfish. Timo still didn’t want to come along, so I decided to go for a second walk. Slowly there became a strong wind. Clouds would become gray. With weather forecast of some rain, this day could be ending. By the time I got back the sun was hidden behind the clouds and it was time to go back to the ferry. Right before we entered the ferry the rain burst. All the way back to Vinales we had heavy rains. Even the weather didn’t end well this day we both enjoyed this day to the max! What a beautiful island! I still think it is too expensive with 35 CUC. 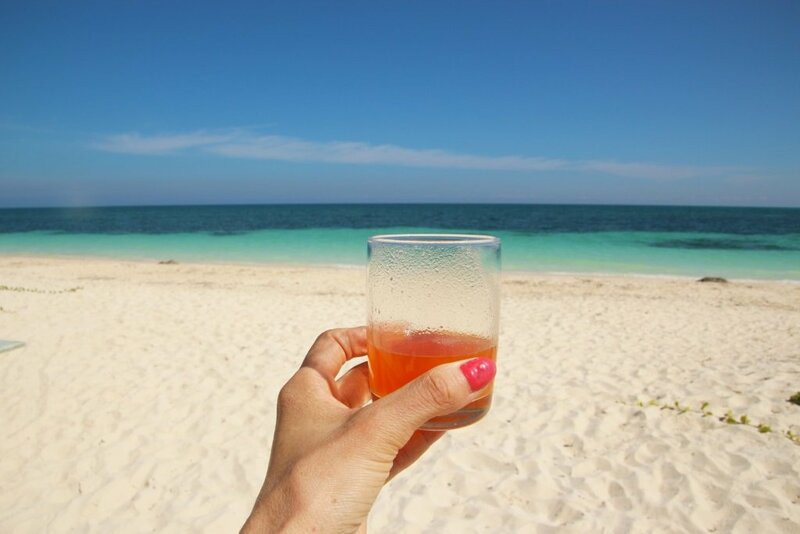 If we had more time, I would have tried Cayo Jutias. This supposed to be another nice island with white sand beaches. Unfortunately we didn’t have the time to explore it. We also visited Playa Larga and Varadero. Two other beaches to explore.